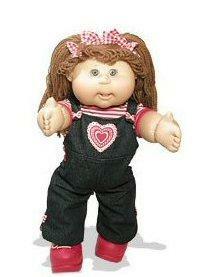 Everybody loves Cabbage Patch Kids! To look at them, you might not think the chubby-cheeked Cabbage Patch Kids are more special than any other doll on the toy store shelves. To the contrary, the Cabbage Patch dolls have a long and lustrous history as both a favorite with kids and as a commercial success. Cabbage Patch Kids came to life in 1976 when a young art student named Xavier Roberts took up the German technique of fabric sculpture, which was popular in the 1800's. He combined this technique with the quilting talents his mother had taught him to create his first fabric-sculpted dolls. By 1981, Xavier had organized his doll-making operations under corporate name of Original Appalachian Artworks, Inc., and the Cabbage Patch Kids, which were then called Little People, were making the national news in such publications as Newsweek and The Wallstreet Journal. This led to a long-term licensing agreement in 1982 with Coleco to manufacture a toy version of Roberts' dolls with vinyl heads and fabric bodies. It is also during this period that the Little People were renamed Cabbage Patch Kids, named so after the 1901 novel Mrs. Wiggs and the Cabbage Patch, written by Alice Caldwell. Now, the legend lives on under distribution by Play Along, and Xavier Roberts' signature still shows up on each doll. Get a Cabbage Patch Baby from Amazon! Many dolls have come and gone in popularity over the decades, but what makes the Cabbage Patch dolls still a favorite with children is a combination of factors, including the size, purchasable accessories, and the fact you do not buy CP Kids; you pay an adoption fee, the same as if you were bringing a new child into your family. The dolls measure 15 to 16 inches in height and their fabric bodies make them squeezably soft. Most toy stores and many retail stores that carry the dolls also stock additional clothing and accessories for them, and many online resources are available to CP Kids' parents who are looking to purchase one-of-kind outfits that have been made by individuals, or you can make your own using many standard 15-inch doll clothing patterns. Probably the most unique feature of the Cabbage Patch family is each doll comes with adoption papers and a birth certificate, giving a child the feeling he or she is really taking home his or her very own baby rather than just another doll. These dolls are affordable, ranging in price between $20-$50, and mom's will appreciate that they are machine washable. CP Kids come in a variety of hair and eye colors, ethnicities, and ages, and you can purchase both boy and girl dolls. You can find Cabbage Patch Babies, which come with pacifiers, bottles, and diapers, or choose Cabbage Patch Kids with either the traditional yarn hair or "cornsilk" hair. The dolls are dressed in a variety of fashion, and additional themed fashions are available for purchase. You can even buy your CPK a Cabbage Patch pet, in the form of a dog or pony. Cabbage Patch Pets come in a variety of breeds and colors as well, and the CPK pets also come with adoption certificates.